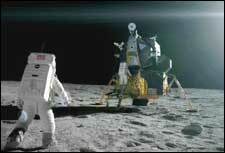 Magnificent Desolation: Walking On The Moon 3D, an English movie, is not currently screening in Hyderabad. The name is beautiful in its aptness. The surface of the moon is desolate but so sublime in its solitude and lifelessness, that it ends up as magnificent, rather than fearsome or ugly. And some scenes in Magnificent Desolation are just that - magnificently desolate, in 3D. To watch acres and acres of a chunk of stardust floating a quarter million miles away from the earth, to walk in its tranquil, yet mysterious darkness, to grapple with its mirages and illusions, and to survive in it, is a trippy experience. fullhyd.com has 700,000+ monthly visits. Tell Hyderabad what you feel about Magnificent Desolation: Walking On The Moon 3D, and then also see all user reviews for Magnificent Desolation: Walking On The Moon 3D!